My future elementary teachers explore the common denominator fraction division algorithm at the end of the semester. 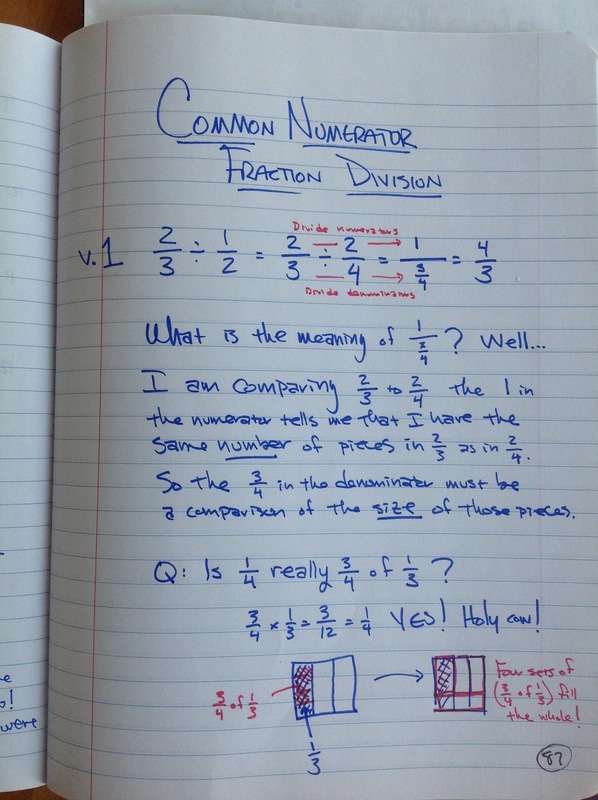 Reading their work got me thinking about common numerator fraction division, and about what sense I could make of the symbols that result. I tried to keep my work neat so others could follow it. If this sort of thing amuses you (as it obviously does me), then you’ll want to take a few minutes with the larger versions of these images. If it does not amuse (and I cannot begrudge anyone this), then you’ll just want to move along; there’s nothing here for you today. Go out and collect a modest-sized, discrete dataset. Name lengths of all of the students in your classroom, say, or the number of people in each of their households. This bar graph is only tangentially relevant, being more of a case-value plot of four different populations. But it breaks up a texty post. So deal with it. Now play with that data. Increase both the median and the mean? Decrease both the median and the mean? Increase the mean while decreasing the median? Increase the Mean Absolute Deviation (MAD) while decreasing the mean? Decrease both the MAD and the range? Decrease the MAD while increasing the range? Thanks to Susan Friel, Connected Mathematics and tons of other creative folks for getting me started with this. Future elementary teachers to tackle this shortly. I’ll report back. This idea started with someone else, but I do not remember his name. I believe he’s a shop teacher in a Twin Cities suburb. Inver Grove Heights, maybe? In any case, he was in a professional development session I was helping to run this year on the topic of fractions. We had a conversation over lunch in which he recounted a lesson he did that became the basis of the activity I am about to describe. If I can dig up the originator, I’ll revise to give credit. In any case, while the kernel of this idea originated with someone else, I have given it the usual OMT treatment—expanding and complexifying in many ways. Regular readers will know that I am always in search of ways to get my future elementary teachers to explore old ideas in new ways. Consider the cases of place value and the hierarchy of quadrilaterals. In that spirit, I give you the measurement exploration extravaganza. Do with it what you will. But-and this is important-THESE LENGTHS ARE NEVER SPOKEN OF! You will never refer to these dowels using standardized lengths. The members of the group measure some stuff with their units. They make a tape measure to use for this purpose, and they decide how long a tape measure they would like to have. For example How tall are you in Sticks? requires (in all likelihood) a tape measure that is several Sticks long. Well, it does not require such a thing, but such a thing facilitates this measurement. 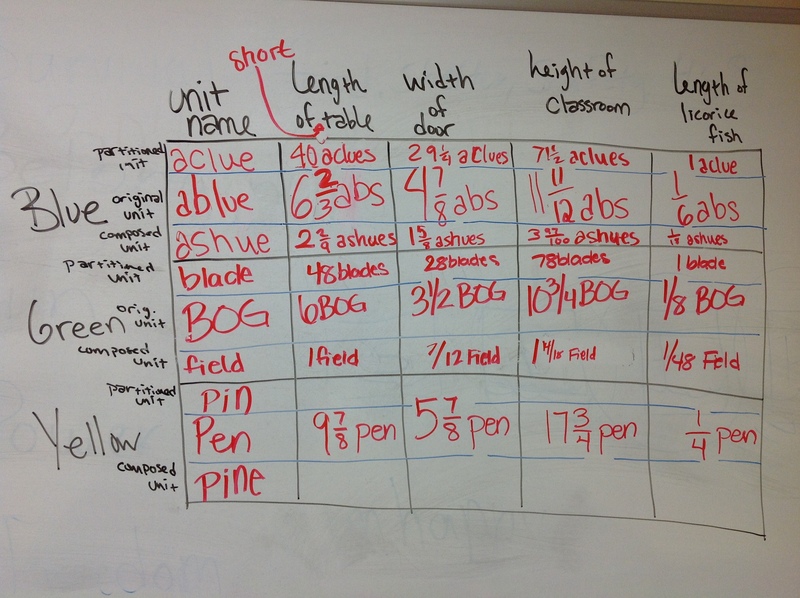 At this point, students are measuring only with their own units. It usually occurs to them to subdivide the unit in some way, and they will frequently report out fractions of (say) a Stick. Next, each group is responsible for creating a partitioned unit from their original. They choose how many of these smaller units make up the original, and they name the smaller unit. And then they create a composed unit from their original. Again, the choice is theirs to determine the number of original units that make up a composed unit. And again they are tasked with naming the composed unit. Students nearly always partition in 4ths, 8ths and 16ths. Students almost never partition into 10ths. Students may group in threes or sixes, but they never ever partition this way. Students rarely think to group the same way they partition. That is, if they made 8ths, they might very well group in sixes. The convenience that would be afforded by consistency does not tend to occur to them in advance. Now that we have the units, we need to measure some stuff. I typically choose things in our classroom environment. It is important that we all measure the same things and that these things range from smaller than the original unit to larger than the composed unit. We need to express our measurements in (1) partitioned units only, (2) original units only, and (3) composed units only. Next, it’s time to switch things up. We put the table away. Each group passes their original unit, together with instructions for creating a partitioned unit and a composed unit (and the names of these) to another group. Get to know the three units that have been handed to you. Express relationships between your units and these new ones. Compute your height in these new units, and compute at least 6 of the measurements in the grid. You have never seen such fraction computation work as proceeds from this sequence of tasks. Now we list these computed measurements on the board, compare to the table we generated earlier and discuss reasons for discrepancies. How do your three units compare to a standard measurement system? How is using someone else’s units like (or unlike) converting between standard and metric systems? How did your choices for partitioning, composing and naming support or impede your work? What do you need in order to be able to do these computations on your own? Next, students build each of their units into square units. How many square partitioned units in a square original unit? How many square original units in a square composed unit? How many square partitioned units in a square composed unit? Most importantly: How do you know each of these? Wow. The square partitioned unit looks a lot smaller relative to the square original unit than I expected. Oh no! Why did we decide to put so many original units together to make the composed unit? This time around, I had them measure the area of a whiteboard in our classroom. Not the most exciting measurement to make, but straightforward and accessible. Working with these new square units is challenging enough; no need to get too fancy. It is important that the measurement be concrete and tangible, not abstract. Students are encouraged to use known relationships in order to avoid tedious measurements, and to measure in order to avoid tedious computations. Importantly (I think), most students want to use these square units to measure, rather than to measure with their tape measures and compute. We use these experiences to discuss differences—both practical and conceptual—among measuring by (1) iterating and counting units, (2) using tools, and (3) computation. We reflect on what these experiences can tell us about working within and across measurement systems. We build on our fraction work and on the meanings of multiplication and division that were the focus of the preceding course. I have not had students move to cubic units. The hundreds chart is a fixture of elementary classrooms. Such a fixture that most of us probably don’t stop to think about it. The trouble with place value is that it is too easy. Q: Why does the hundreds chart have 10 columns? A: Because our number system is base-10. 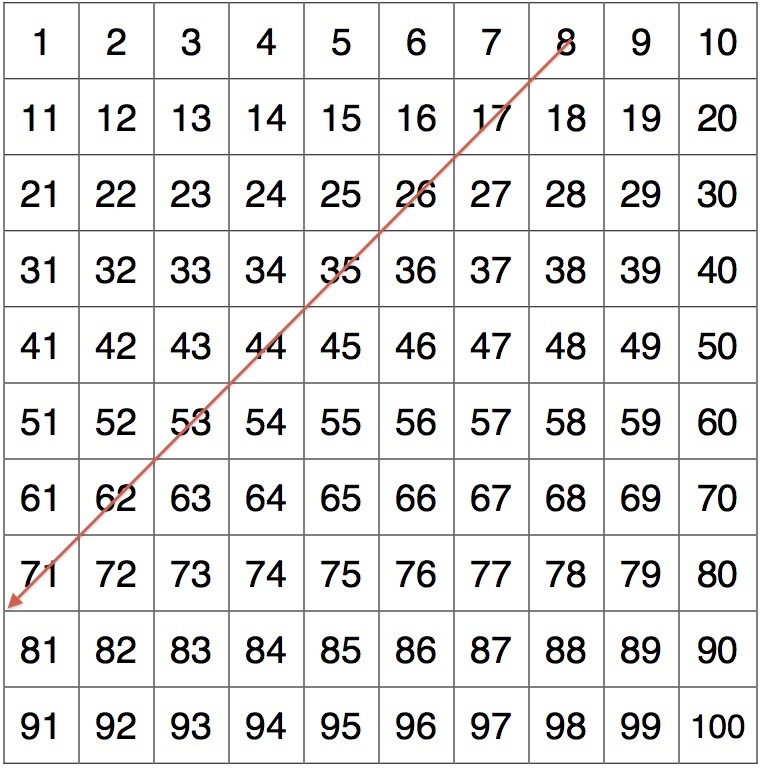 Q: Why does the hundreds chart have 10 rows? 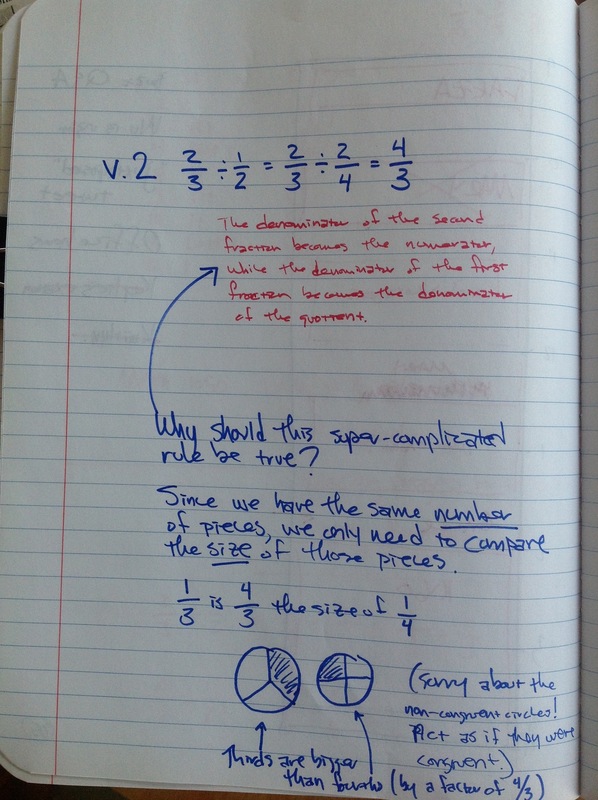 These answers are so simple that they mask the conceptual complexity underlying place value. The hundreds chart is rich with patterns. The double-digit numbers lie diagonally. If you start with a number in the top row and read diagonally down and to the left, the digits of the numbers sum to the number in the top row. Why do these patterns exist? 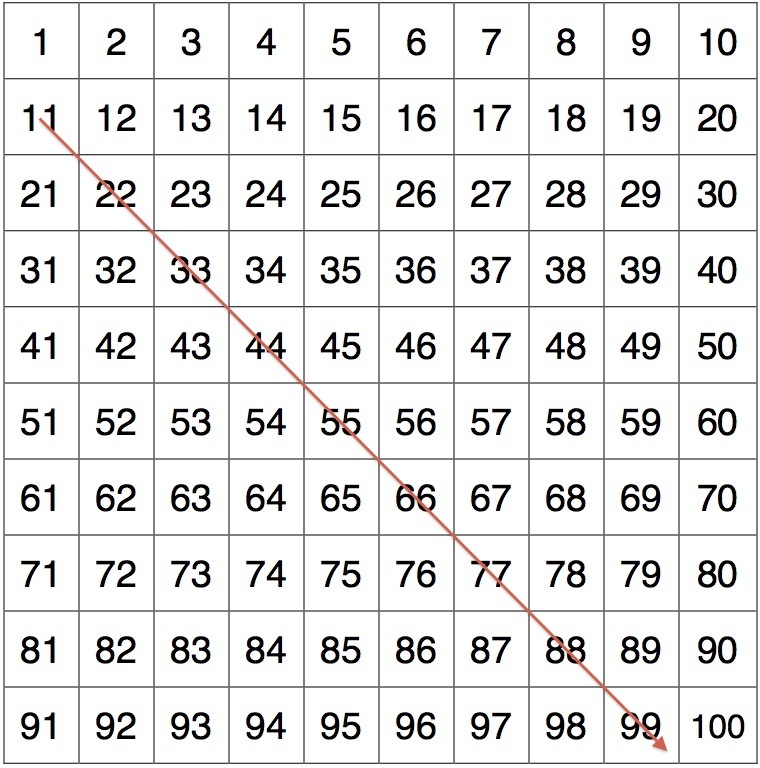 Because the structure of the hundreds chart matches the structure of the number system. But there is something unsatisfying about this answer. So here’s a thought experiment. 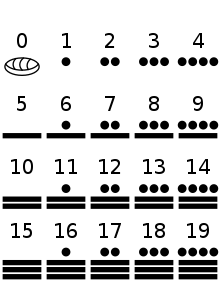 The Mayans had a quasi-base-20 place value number system. Quasi-base-20 because the third place was not worth 20 twenties, but only 18 twenties. All other places have value 20 times the previous. Imagine stepping into a second-grade classroom in a modern society that used the Mayan numeration system. What chart would they have on their walls instead of our hundreds chart? What would a Mayan “hundreds” chart look like? I have used this question as one of two parts of an A assignment in my math content course for future elementary and special ed teachers for several years*. We want to represent place value in the hundreds chart and this chart does not do that. All of these are single digit numbers as far as Mayan place value is concerned. That chart above is the equivalent of one that goes 0—9 in our decimal place value system. Another common example has literally 100 cells, in 10 rows of 10. Also no good. 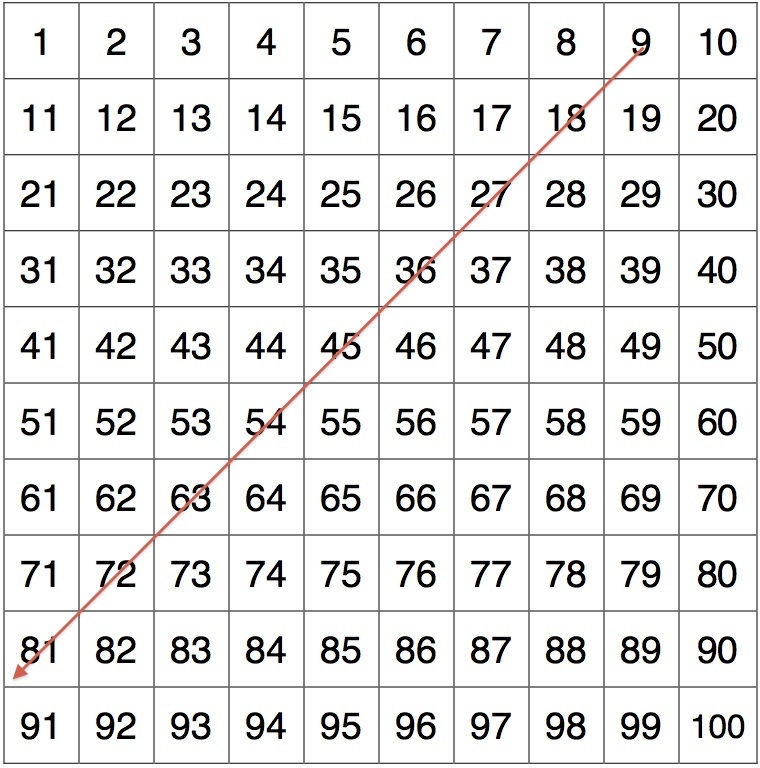 That chart is based on the structure of our number system, not the structure of the Mayan number system. No, we want a Mayan “hundreds” chart that has patterns equivalent to those we find in our hundreds chart. Patterns such as the ones highlighted above. Credit to student Angela Drietz for the complete chart. Here are the double-digit numbers. And if you look closely, you can add the “digits” on the leftward-running diagonal to get the number in the top row. That, my friends, is the beauty of place value. It’s not 10, the quantity, that is special. It’s the set of symbols. It’s the 1 and the 0. * The other part is to create number language to reflect the place value structure of the Mayan number system. How might the Mayans have read these numbers aloud? As far I know, no one knows the answer to how they did read them aloud, so the task allows for structured creativity. A small collection of unrelated items. My future teachers see things differently than my readership. Readership was strongly in favor of pennies as parts of a dollar, with the dollar being the natural unit. My future teachers were strongly in favor of the penny as the natural unit, and the dollar being composed of pennies. The results from my classroom ought to at least make us stop and think about the effectiveness of money as the go-to tool for explaining decimals. At least one of my students remembers the pennies/dollars conversation as one in which I came out in favor of a dollar being composed of quarters. The morning after the temperature conversation I documented recently, it was even colder. I asked Griffin to guess the temperature, with the hint that it was below zero. He guessed -10. It was -7. He had no problem stating that his guess was 3 degrees too cold. I had a conversation with Sadie Estrella recently in which she made me wonder, What is the right amount of information for third graders to have about similar shapes? I have no idea what the answer to that is, and correspondingly I wish someone would write the geometry equivalent of Children’s Mathematics. The ALEKS developmental math curriculum includes (among many others) this topic: “Solving a rational equation that simplifies into a linear equation,” which seems entirely too specific to me and exemplifies what is broken in so much of developmental mathematics. My future elementary teachers think explicitly about patterns and struggle to think recursively. My College Algebra students think recursively and struggle to think explicitly. I do not understand why there are names for arithmetic and geometric sequences, but not for those that are described by a quadratic function on the natural numbers (except special ones like square and triangular numbers). If something is free, according to Tabitha, it cannot be described as an extreme case of cheap.